Jen, an elflike “Gelfling” ventures on a quest to restore balance to his alien world by returning a lost shard which is found to be part of the Dark Crystal, and must be reinserted to restore the Crystal's integrity. 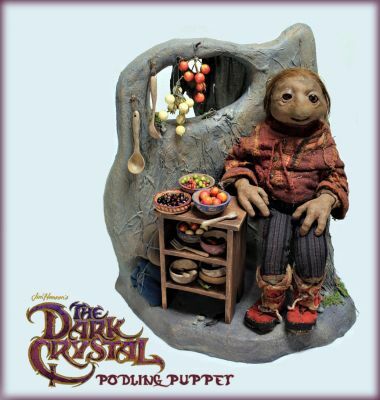 From the 1982 Jim Henson and Frank Oz film The Dark Crystal, this is a complete Podling Muppet used in the film. Being made by the iconic Jim Henson Creature Shop, this puppet still has the cables used to control him and his complete wardrobe. The Podlings, also known as “Pod People” were a sentient race native to Thra. In their own language, they referred to themselves as apopiapoiopidiappididiapipob, which translated as "master gardneners who live in bulging plants." They were a rural and hedonistic race, who lived only to sing, dance and tend to their plants. Incredibly rare to find any complete Muppets used in the Jim Henson productions while being presented on a custom themed display to mimic the Podling’s natural habitat.